Surrounded by water on three sides and home to the Everglades, Florida is blessed with an impressive array of fish and wildlife. The state boasts more than 700 terrestrial animals, more than 200 freshwater fish and more than 1,000 marine fish. Snakes, sharks and alligators are but a few of Florida's fascinating residents. Fifty species of snakes make homes in the Sunshine State. Six of those snakes are venomous, including the southern copperhead, the Florida cottonmouth, the eastern diamondback rattlesnake, the timber rattlesnake, the dusky pigmy rattlesnake and the eastern coral snake. The Florida Museum of Natural History website recommends leaving any snake you find alone, venomous or nonvenomous. The website notes that snakes play a vital role in the state's ecosystem and that they are more afraid of you than you are of them. Snakes are all over the state, found in marshes, scrub areas, woodlands, golf courses, backyards and even parking lots. With the Atlantic Ocean on one side and the Gulf of Mexico on the other, Florida has ample space for sharks. The blacktip shark grows to about 6 feet long and is common in the state's coastal waters, bays and estuaries. You may reel one of these guys in if you fish. At 3.5 feet, the bonnethead shark is no threat to humans and is a good catch for sport fishermen. The lemon shark is found near the shores of the Gulf and Atlantic coasts, even venturing from marine to freshwater areas. They're big, at 8 feet, and they cope well in captivity, though they've been responsible for a few attacks on humans. The nurse shark is found on both coasts as well, usually seen lying still on the bottom. Reaching up to 9 feet, this is a sluggish bottom dweller who has been involved in a few attacks on humans, mostly after being provoked. Florida's most dangerous sharks have names that reflect their potentially threatening nature: the bull shark, great hammerhead shark and tiger shark. The great hammerhead is the least dangerous of the three, ranking seventh on the list of sharks in unprovoked attacks on humans. He maxes out at 8 feet long and is found in the shallow waters of both coasts. The bull shark is third on the list of attacks on humans and is one of the few sharks who can inhabit freshwater. He's the smallest of the three dangerous sharks in the state, reaching about 6.5 feet in length, and does well in captivity. The tiger shark is Florida's most dangerous shark, second only to the great white shark in attacks on humans. He's common throughout the state's waters, including river mouths, shallow bays and open ocean. He's a whopper, reaching 18 feet and 2,000 pounds. If you're looking for an alligator in Florida, chances are you won't have to look far; all 67 counties in Florida have alligators. As more people gravitate toward the state's waters, building homes and enjoying themselves on the water, there's more human-alligator interaction. 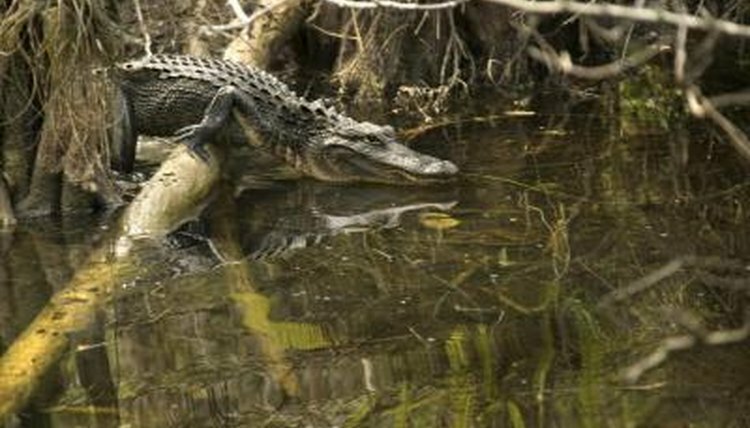 The state considers alligators under 4 feet long to be essentially harmless as, at that length, they're not dangerous if left alone. Alligators prefer wetland habitats, including canals, lakes and swamps. They'll eat a variety of animals, including fish, turtles and, if the alligator is large enough, house pets. Male alligators max out at 12 feet in length, the ladies usually at 9 feet.